I apologise, dearest reader, for the tumbleweeds bouncing through this blog in recent weeks. I have been neglecting you in favour of another: pouring my frothing muse into longer works of fiction. I’m pleased to say the first of these has now set and been whittled into editorial shape via the passage of time, a drawer, and some helpful feedback. I’m not writing as David Smith since that returns more hits on Google than there are atoms in the universe. To be read you first have to be found, and my real name is — unless you are very determined — a near-synonym for anonymous. Not Anonymous, just anonymous. Nor am I writing as Avaragado, as people can’t say it (av-uh-ruh-GAH-doe) or spell it (tip: it’s all a’s apart from the o) and I’d need to make up a first name or last name to jigsaw onto it or else spend precious nerd energy fighting Facebook and Google+ naming policies. After much deliberation I settled on Anthony Camber. “Anthony” is my middle name and my Dad’s name; and “Camber” is, as many of you know, a place on the south coast that holds fond memories for me, and which I’ve been visiting on and off all my life. 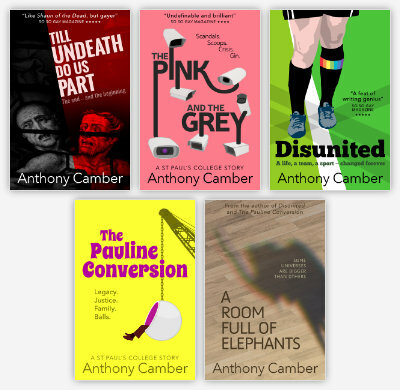 And, excitingly, I could get anthonycamber.com and @anthonycamber, and there’s nobody else with that name on Amazon, and there doesn’t appear to be an under-23 Welsh rugby player with that name, and so on. The first story I’m publishing is a novella, running at just under 25,000 words. If you haven’t already zipped over to anthonycamber.com it’s called Till Undeath Do Us Part, and it’s about zombies in Cambridge (with a side-order of gay). As much as I’d like to claim the label it’s not exactly a HomZomRomCom, but there are elements of all four oms. It is apparently “A right rollicking read” and “Highly recommended” (Mr C Walsh, Cheque-in-the-Post, Cottenham). It’s available now on Kindle. You can, and indeed you must, start reading in under a minute. iPad/iPhone/iPod Touch owners will have to wait up to a couple of weeks for it to emerge glittering from Apple’s mysterious approval process into the iBookstore, or use the Kindle reader app/site instead. I already have a first draft of a second story: longer, at 64,000 words. It’ll be available in a month or two I expect, once I have battered it into shape. I make no pretence of literary greatness. I’m writing because I enjoy writing. If people like it and pay me for it, even better. I will, of course, do almost anything in exchange for gushing, five-star reviews and shameless pimping. Very true! I shall clarify the post. Are you planning on making it available DRM free and in the standard ePub format, or do you hate me, Cory Doctorow and people in general? An unmentioned aspect of the pseudonym is how it sorts earlier in the alphabet. It may not seem like much but is really important in this day and age. In both the Kindle and iBookstore uploads I endeavoured to turn off DRM. I am planning to make the ePub available RSN, probably via lulu.com.